From P.D. James, one of the masters of British crime fiction comes the tenth novel to feature commander Adam Dalgliesh. A Certain Justice is a chilling murder mystery packed with forensic detail, set in the treacherous legal world of London. Venetia Aldridge QC is a distinguished barrister. When she agrees to defend Garry Ashe, accused of the brutal murder of his aunt, it is one more opportunity to triumph in her distinguished career as a criminal lawyer. But just four weeks later, Miss Aldridge is found dead at her desk. Commander Adam Dalgliesh, called in to investigate, finds motives for murder among the clients Venetia has defended, her professional colleagues, her family - even her lover. As Dalgliesh narrows the field of suspects, a second brutal murder draws them into greater complexities of intrigue and evil. P.D. James, the bestselling author of Death Comes to Pemberley, Children of Men and Death In Holy Orders, once again explores the mysterious and intense emotions responsible for the unique crime of murder, with authority and sensitivity. 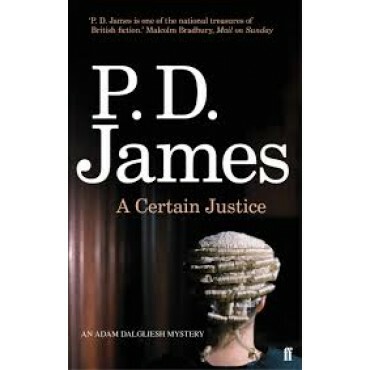 A Certain Justice is set in the legal world of London and possesses all of the qualities which distinguish P.D. James as a novelist.